July 22, 2013--I mentioned in an earlier blog that my favorite app is HanDBase Database Manager. 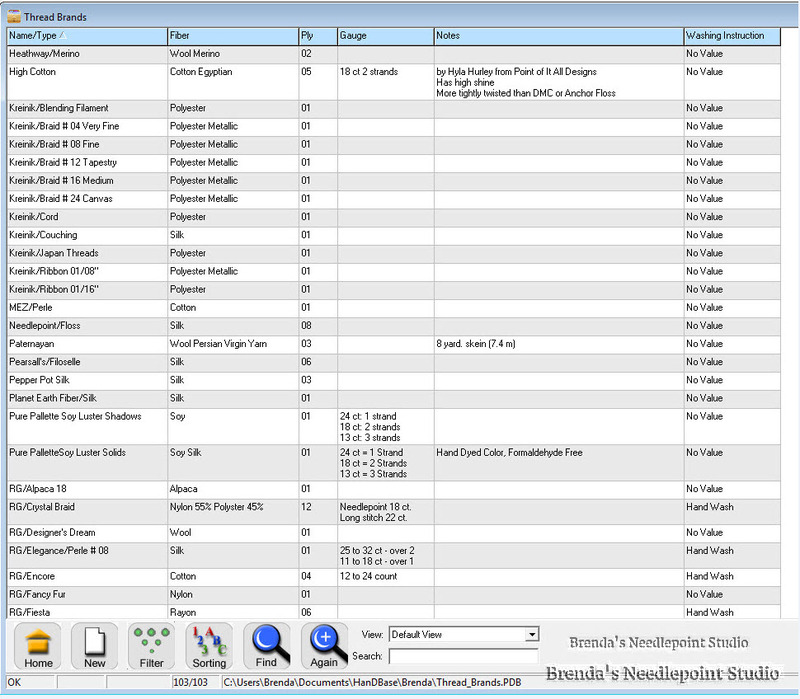 It has enabled me to inventory all of my threads, books and projects (with pictures). Data can be entered on my PC or on my iPhone, then the two can be synced. I chose this software because I couldn't find anything in the "app" market that would allow for the storage of a high volume of data or give me the flexibility to add or subtract fields I wanted in each record. Today I'll talk about my threads inventory. 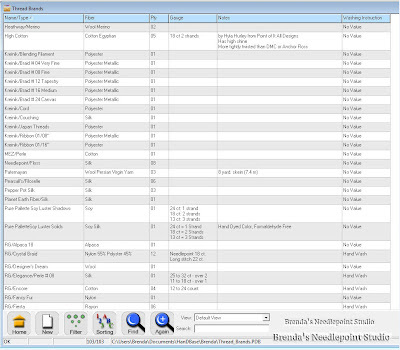 Below is a screen capture of the Threads Inventory Database as it appears on my PC. I am able to see this same information on my iPhone. 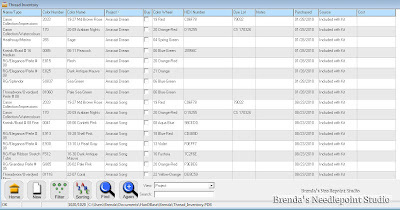 The inventory can be sorted by any field, such as thread name/type, color number, project, etc. (sorting can be done on my PC or on my iPhone). 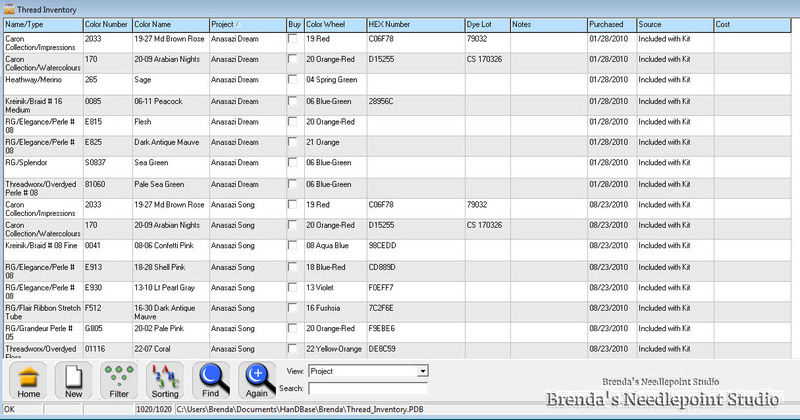 The picture below shows the database sorted by Project, the first being Anasazi Dream. You can see a list of threads used in this project, showing the thread name/type, color number, color name (if available), project in which it was used, color wheel number, HEX number, dye lot, notes, when purchased, from what source, and cost. When I sort this database by Name/Type, I'm able to see what I have in my stash--useful when buying threads for a new project, or making substitution decisions. It's also helpful to see what project a thread was used for--I can easily refer to the project to see how it covered the canvas, what stitches were used, etc. The field labeled "Name/Type" in the above example only shows the brand name of the thread and whether or not it's a floss, perle, and its size. For more information about the thread, such as its fiber content, ply/strands, washability, gauge, etc., I have another database for that called Thread Brands. The screen capture below shows the setup. Most of the information is taken from the package or card around which the thread is wrapped. However, instead of typing in the thread name/type, all I need do is hit the little arrow to the left of the field name (using Name/Type as an example) and up pops the Thread Brands database. Then I scroll down to the thread I'm looking for. If my new thread is a Kreinik Braid #4, I would scroll down to that thread brand and hit enter. This is a huge convenience when you have a project that's using many colors of the same type of thread, such as DMC floss. Of course, if I'm adding a new thread brand to my inventory that I've never used before, I must first add it to my Thread Brands Database. The other fields which point to separate databases are Project, Color Wheel and Source. I'll discuss the Project Database in another blog. The Color Wheel Database is a list of color ranges as used by Joen Wolfrom's Color Tool. I find this very helpful when looking for threads I own in a particular color range, for example, blue-green (color card 06 in the Color Tool). The Source Database shows how the thread was acquired--whether or not it was included in a kit, purchased from a store, part of my stash, etc. This field doesn't have a separate database, but has something called a "pop up list" where you can pick from a number of items such as where the thread was purchased, if it was included in a kit, etc. If you have read this far into the blog, kudos! I know there's a lot of information here, but hopefully it will be helpful if you decide to set up your own inventory using a database type of app. Please note that I am not a computer/software guru and had never used Access type software before. This was all new to me. 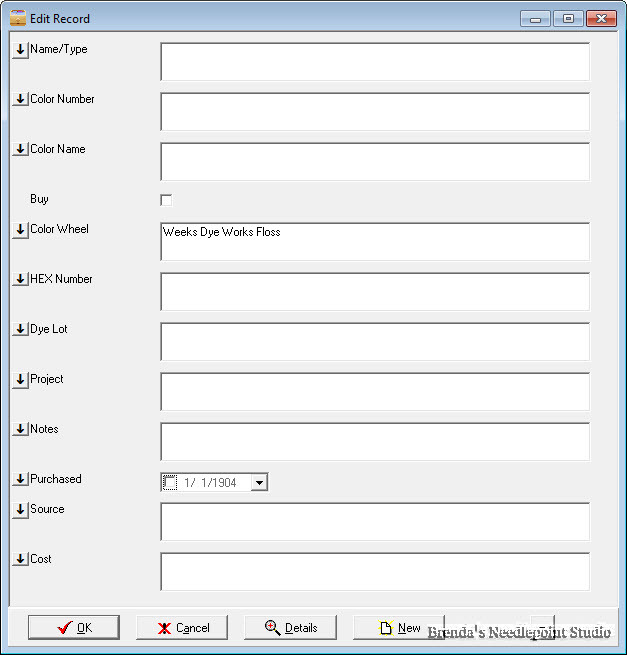 However, DDH Software has some great tutorials and lots of examples of how their customers use HanDBase, and it was from there I began to formulate how I would set up my databases. If you have any questions, please add them to the comment section and I will respond ASAP. Thanks! I was wondering just how this worked. The details are very interesting and helpful since many folks have trouble visualizing just how they should set up a database's structure. I've updated the article on Blog with this link and will update again when you talk about the Project Database.